Sayyed Ja'far Pishevari (1893 – 11 June 1947) (Azerbaijani: Seyid Cəfər Pişəvəri, سید جعفر پیشه وری, Persian: سید جعفر پیشه‌وری‎) was the founder and chairman of separatist and communist Azerbaijan People's Government (November 1945 – November 1946), created and supported by Soviet occupational forces in north-western Iran. He was born in Khalkhal in Ardabil province, Iran. He had lived in the Caucasus in the early 20th century and was introduced to Marxism during this period. He was a member of the Russian Social Democratic Labour Party. He was a founding member of the Communist Party of Iran (not to be confused with the Tudeh Party), established in 1920, in Rasht. He became a journalist and communist activist in the 1920s. He was arrested and imprisoned during nine years in the late 1930s and early 1940s by the government of Reza Shah Pahlavi for his communist ideas and activities. He was released from prison after Reza Shah was deposed by the Allies in 1941. He went to Tabriz and established the Azerbaijani Democratic Party with manifest material and organizational support from the USSR. He was the ADP candidate for the Majlis and was elected, but was denied entry by the rest of deputies. Of the 100 votes cast, his credentials were rejected 47–50. The Soviet Union founded the communist Azerbaijan People's Government in November 1945 during their occupation of Northern Iran, making Pishevari its leader. It seems however that the strong man of this government was Mohammed Biriya, Minister of Propaganda and head of a secret police trained by the NKVD. His government's actions, including organizing and arming local militias, disarming of regular Iranian military and police forces, setting up an independent judiciary based on the Soviet legal system, nationalising banks, levying taxes, land reform without ratification of the Majlis, using Azerbaijani as the official language and banning the usage of Persian, and setting up an alternative curriculum and educational system, were viewed with deep suspicion by the central government and other Iranians. Following an agreement reached between the governments of Iran and the USSR under intense American pressure, who viewed Pishevari's government as a not-too-subtle scheme by the USSR to partition Iran, Soviets removed their protection. Iranian armed forces, kept away from the provinces of Azerbaijan and Kurdistan by the Red Army presence since 1942, entered these provinces in November 1946. Pishevari's self-proclaimed government collapsed quickly, as many of the people welcomed the central government's troops. By December 1946, both Azarbaijan and Kurdistan were evacuated by the Soviet forces and the Iranian government re-established control over the USSR-occupied territories. It appeared as if Pishevari's government was becoming very unpopular, especially in larger cities where the merchants feared communism. After the collapse of this short-lived republic, he fled to Azerbaijan SSR and died in a car crash in Baku in 1947. Some historians speculate that he was killed by the KGB. To date, their claim has not been verified. His legacy is a matter of heated debate today. While many Iranians consider him as either a Soviet stooge or a traitor, he is considered a national hero for Azeri nationalists or a socialist revolutionary by the Iranian Left. It is now beyond doubt that he had the support of Joseph Stalin and the USSR in setting up his government. There is also no doubt that USSR indeed wanted to annex several provinces in northern Iran. Available sources show that Soviet territorial aspirations included provinces of Azerbaijan, Kurdistan, Gilan, Mazandaran, and Khorasan. What Pishevari intended to achieve and his role in the Soviet plans is a matter of debate though. Some scholars on the Left argue that he never intended to partition Iran and what he wanted was a gradual transformation of the whole country to a communist state. Those on the Right argue that the proclamations and directives issued by his person and his government leave no doubt that he intended to join his republic to the Azerbaijan SSR, and thus the Soviet Union. ^ a b آشنایی با تاریخ مجالس قانونگذاری در ایران دوره اول تا دوره شانزدهم [History of Legislatures in Iran (1285–1328)] (in Persian). Majlis Research Center. 2005 . p. 266. ^ a b c d e f g Sebestyen, Victor (2014). 1946. The Making of the Modern World. Pan Macmillan. ISBN 0230758002. ^ Atabaki, Touraj (2000). Azerbaijan: Ethnicity and the Struggle for Power in Iran. I.B.Tauris. p. 74. ISBN 9781860645549. Adib Boroumand (or Adīb Borūmand) (Persian: ادیب برومند‎; 11 June 1924 – 13 March 2017) was an Iranian poet, politician, and lawyer. He was the head of the leadership council and chairman of central council of the National Front of Iran. He is known as the national poet of Iran. He was born on 11 June 1924 in Gaz, Borkhar County, Isfahan, Persia (present-day Iran). He received a BA in Judicial Law from the University of Tehran, and since then he had been lived in Tehran. He died on 13 March 2017 at the age of 92. Ahmad Kordary served as Prime Minister of the Azerbaijan People's Government from 1945 to 1946. The Chairman was Ja'far Pishevari. Ardashes "Ardeshir" Ovanessian (1905–1990) was an Iranian communist leader of Armenian origin. The Azarabadegan Medal was founded by Mohammad Reza Shah Pahlavi, the Shah of Iran, on 12 December 1946. In November 1945, the Azerbaijani Democratic Party formed a short-lived Soviet Union puppet state in Iranian Azerbaijan with Ja'far Pishevari as president. However, with the support of the United States and Britain, the Iranian army reentered Tabriz and dissolved the Azerbaijan People's Government. The Shah awarded the medal to the military soldiers involved in the battle. The Azerbaijan People's Government (APG; Azerbaijani: Azərbaycan Milli Hökuməti; Persian: حکومت خودمختار آذربایجان‎; Russian: Азербайджанское народное правительство, translit. Azerbajdžanskoje narodnoje praviteljstvo) was a short-lived unrecognized secessionist state in northern Iran from November 1945 to December 1946. Established in Iranian Azerbaijan, the APG's capital was the city of Tabriz. Its establishment and demise were a part of the Iran crisis, which was a precursor to the Cold War. Fereydun Ebrahimi (Azerbaijani: Firudin İbrahimi, Persian: فريدون ابراهيمي‎ ; 1919 in Astara – 1947 in Tabriz) was an Iranian Azerbaijani Jurist and politician. He was chairman of the Azerbaijani Democratic Party in Astara, and a graduate of faculty of law of Tehran University. Ebrahimi was the Procurator-General of Azerbaijan People's Government in 1945. He was executed in Tabriz after the fall of Azerbaijan People's Government. Ghulam Yahya Daneshian (Azerbaijani: Qulam Yəhya, Persian: غلام یحیی دانشیان‎ ; born 1906 in Sarab, East Azerbaijan — death 2006 in Baku) was an Iranian Azerbaijani politician and military. He was a general in the Azerbaijan's Government Army and Commander of National Army. Also Ghulam Yahya was Deputy Minister of War Ja'far Kavian in the Pishevari cabinet. Ja'far (Arabic: جعفر‎), meaning holy water'’, is a masculine Arabic given name, especially common among Shia Muslims. It may also be transliterated Jafar, Jaffar or Jafer or Jaffer or in Egyptian Arabic pronunciation, gafar. The Turkish spelling of the name is Cafer. The Bosniak spelling of the name is Džafer and the Albanian one is Xhafer. Ja'far Kavian (Azerbaijani: Cəfər Kavian, Persian: جعفر کاویان‎ ; born 1895 in Tabriz — death 1975 in Baku) was an Iranian Azerbaijani politician and military. he was a Major general in the Azerbaijan's Government Army and was Minister of War in the Pishevari cabinet. Les Ballets Persans (Persian: سازمان باله ایران‎) is the successor company and the recreation of the former Iranian National Ballet Company (Persian: سازمان باله ملی ایران‎). Based in Sweden as a non-profit and non-governmental organization, Les Ballets Persans is an internationally touring dance ensemble founded by Nima Kiann, the Iranian born Swedish dancer, ballet master, choreographer and dance scholar. Les Ballets Persans is also known as The New Iranian National Ballet and has been regarded as the most extensive artistic Iranian project ever realized in exile.Since its establishment in 2002, Les Ballets Persans has been collaborating with national ballet ensembles of former USSR countries. The company has within its own productions introduced and promoted national ballet companies of Azerbaijan, Tajikistan and Kyrgyzstan in the West for the first time after these countries’ independence following the fall of the Soviet Union. Mansur High school or Taleqani High School (in South Azerbaijani: منصور مدرسه‌سی, in Persian: (دبیرستان منصور (طالقانی) is an old high school located in city center of Tabriz. A reconstruction of the main building started in August, 2012. Mohammad Biriya and the original name Mohammad Baghezadeh (Azerbaijani: Məhəmməd Biriya, Persian: ;محمد بي‌ريا‎ 1914 in Tabriz – 1985 in Tabriz) was an Iranian Azerbaijani poet and politician. by Ja'far Pishevari with the formation Azerbaijan People's Government in 1945, was Culture Minister of Azerbaijan's Government. Musa Gasimli (Azerbaijani: Musa Qasımlı) (born 28 October 1957) is an Azerbaijani and Soviet historian, researcher, Doctor of Sciences (historical sciences), member of the National Assembly (Azerbaijan) (Milli Majlis]] by IVth and Vth convocation (2010 - 2015; 2015 –2020) and Director of the Institute of the Caucasus Studies of the Azerbaijan National Academy of Sciences. Nosrat-ollah Jahanshahlou was a leftist Iranian politician. He was among The Fifty-Three group who were arrested because of their political activities in November 1938 in Iran. After World War II he joined to the separatist movement of Azerbaijan People's Government in Tabriz. During this time he served as the first chancellor of University of Tabriz. After collapse of the Azerbaijani government by the Imperial Iranian Army, he fled to USSR with couple of other members of Azerbaijani Democratic Party. After 26 years of residing in Soviet Azerbaijan he immigrated to East Germany, then to Switzerland. Rabi-ollah Kabiri (Azerbaijani: Mirzə Rəbi Kəbiri, Persian: ربيع‌الله كبيري‎ ; born 1889 in Maragheh — death 1947) was an Iranian Azerbaijani general and politician. In 1945, he became Road, Post and Telegraph Minister of Azerbaijan People's Government of northern Iran in a cabinet led by Ja'far Pishevari. Salamullah Javid (Azerbaijani: Salamulla Cavid, Persian: سلام‌الله جاوید‎ ; born 1900 in Khalkhal — death 1986 in Tehran) was an Iranian Azerbaijani physician and politician. 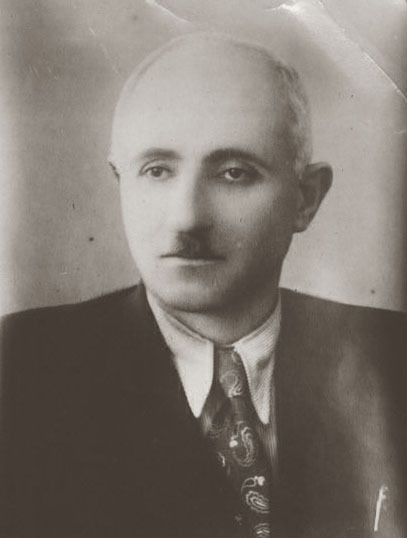 by Ja'far Pishevari with the formation Azerbaijan People's Government in 1945, was Governor of Azerbaijan and Interior Minister of Azerbaijan's Government. After the defeat of Azerbaijan People's Government was imprisoned After his release, withdrew from political activities and in Tehran paid into medicine. also Salamullah Javid was founded Azerbaijan Cultural Society in Tehran. Zeynalabedin Qiyami (Azerbaijani: Zeynalabidin Qiyami, Persian: زین‌العابدین قیامی‎ ; born 1891 in Ahar — died in Baku) was an Iranian Azerbaijani politician and Jurist, by Ja'far Pishevari with the formation Azerbaijan People's Government in 1945, was Chairman of Supreme Court of Azerbaijan's Government in the Ja'far Pishevari Cabinet.